Black Gold G.C. 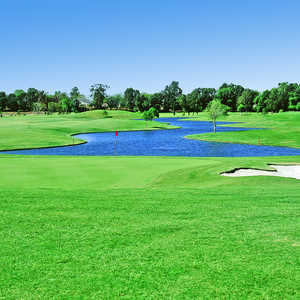 is one of the best values in Orange County daily-fee golf. "And up through the ground came a bubbling crude. Oil that is, black gold, Texas tea." 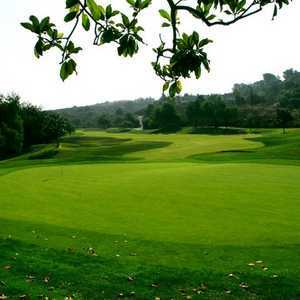 This Orange County daily-fee golf course, built on a former Shell Oil field (drill bits are your tee markers), was designed by Arthur Hills and is set in the scenic hills a half mile east of the Richard M. Nixon Library and Birthplace and adjacent to Chino Hills State Park. But if you think Mr. Nixon was tricky, just wait until you putt on these greens -- they have foothills slopes and glassy smooth, treacherous rolls. If you don't get a handle on the correct speed and contours early in your round at Black Gold Golf Club, you will be looking at a multitude of three putts and mumbling about extensive work on the practice greens. "No doubt the majority of the comments we get are about the undulations and the quick speed of our greens," said PGA Professional Art Guevara. "We take pride in our greens and think they are among the best in Orange County." Added Brittany Kelley, Black Gold Golf Club's director of sales and marketing, "I think the putting challenges make many golfers want to come back to see if they can improve and figure out these greens." Black Gold Golf Club measures 6,756 yards at par 72, and on a clear day you can see vistas that include Disneyland, Anaheim, Long Beach, the Pacific and Catalina Island from several points along the course. The 12th tee box, the highest point in Orange County, sits at 725 feet above sea level and serves as a downhill gauntlet hole 375 yards away amongst the rolling hills and strategic bunkering. What's different from the norm is you don't see a par 3 until the seventh, a 167-yarder downhill and then they come in bunches. No. 8 is 220 yards that can be even longer with the prevailing wind against you, and the green sits diagonally from left to right making the back right placement difficult. Black Gold Golf Club's 10th hole is a scenic 194-yarder with a pond in front and barren hills to the left. The last par 3 is a tough beauty at No. 16, a 216-yarder with a front bunker making a pin behind it a tiny target. The golf course culminates with a pinpoint drive on No. 18 and an accurate second shot to a green guarded by a pond and waterfall. Drive to the No. 10 tee box and you will see the charred remains on the hillside to the left of the 2008 freeway complex fire that destroyed many homes, but some say the golf course acted as a buffer zone and slowed the fire saving many more homes. A firefighting helicopter also used the pond on the 18th to gather water for fighting the fire. Early news reports, with all golf course employees evacuated, falsely reported that the golf course and clubhouse had been destroyed. You can imagine the feeling of the employees when that news leaked out. Black Gold had to post a special bulletin on its Web site to let everyone know that the golf course had survived the fire. Black Gold Golf Club is a fun golf course that makes you get serious over any putt. It is near a large population center, but you can escape on the course and feel like you are in the boonies -- especially with Chino Hills State Park just right next door. If you like roller coaster fairways, uphill, downhill and sidehill lies, and panoramic views, this one is for you. And because it was built on 219 acres, there's plenty of room to play without seeing others throughout your round. Professional instruction is emphasized at Black Gold Golf Club. A lighted practice facility features natural turf stations and a practice green, ready for evening practice after work. PGA-Certified Instructional programs for individuals, groups, juniors, seniors and women are available along with corporate clinics offered and packaged in outings. Black Gold Golf Club offers "Best In Class" course conditioning and VIP customer service, both of which are top priorities of the staff. Black Gold set a goal to be a Southern California leader in course conditions and curb-to-curb customers. The Global Positioning System on every cart provides scoring for tournaments and the ability to order food. The clubhouse spans 20,000 square feet and was designed with weddings, special events and banquets in mind that can accommodate more than 250 guests. 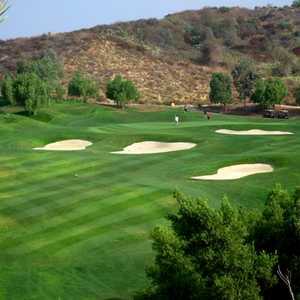 The Residence Inn Anaheim Hills Yorba Linda is your Stay and Play home for Black Gold Golf Club. High-speed Internet access is included as well as breakfast, weekly barbecues and evening hospitality hour. Pool, heated spa and sport court add to the amenities. It is located at 125 South Festival Drive, Anaheim Hills, California. Phone (714) 974-8880 or log on to www.marriott.com. I agree on the greens. Nice views. Good service. You captured the course. I love the lighted driving range. Thanks for the story.